In 440BC, all the young Alexander wants to be is an Olympian. But while trying to follow his hoplite father, Alexander becomes trapped aboard a troop ship. His life spins out of control when making port, the seemingly benign state of Samos overthrows the mighty Athenian army and tragedy strikes. He soon realises that the foes in his own camp are more dangerous than the Samian rebels. When one of his only friends and allies on the island goes missing, Alexander has to further endanger his own life to try and find him but by doing so he puts his friend's life, and his mother back in Athens, in danger. 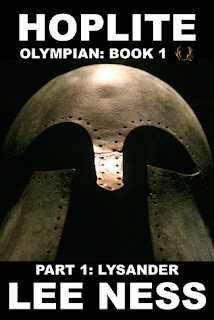 Note: This novella is Part 1 of Hoplite. The other five parts will be released over the course of the year. Book description for Part 1. This story starts off somewhat mysterious. We have a young boy, Alexander, who is sneaking along the docks. He is trying to locate his father. The reason we learn is that his father is going off to battle. He had been bullied and the way he handled it didn’t turn out right. His mother doesn’t really belong in Athens and as an outsider can own no land. With her son gone she is in danger from the people where she lives. Alexander spots his father. His desire is to speak to him and then go home. To avoid being seen he is grabbed and told to carry something aboard his father’s ship. He hides below deck where he falls asleep. When caught by a soldier he ran into on shore he is smacked around, until his father rescues him. Under his father’s care he is protected. He is stuck on board until they can get him back home. This means he will follow his father to the battle. When he sees his father killed things go from bad to worse. How will he get home? Was his father’s death his fault? Alexander is a very brave young man who finds himself in circumstances he should never have been in. This book will keep you turning pages until you reach the end. It will also keep you waiting and wanting the next in this series. This is an awesome book.Alexander is a very brave young man who finds himself in circumstances he should never have been in. This book will keep you turning pages until you reach the end. It will also keep you waiting and wanting the next in this series. This is an awesome book.